Grill your meat, vegetables, fish, shrimp, pizza, kabobs, even pancakes, bacon and eggs without using cooking oil! 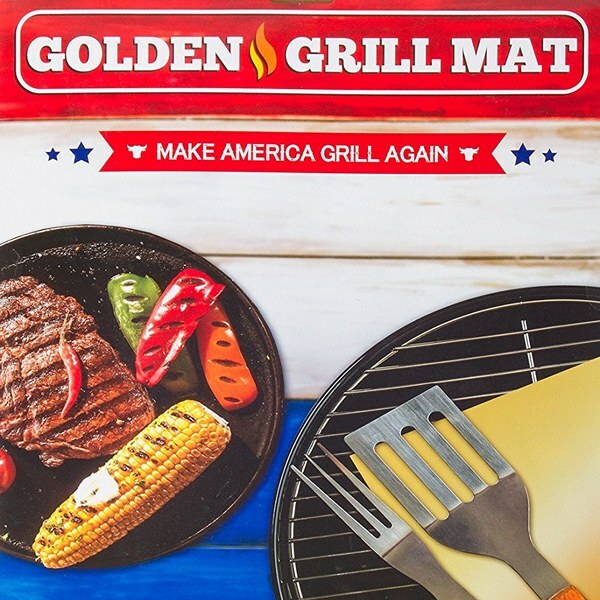 The Golden Grill Mat sits right over your grill grates preventing your food from falling through the cracks! It works with any kind of barbecue grill; charcoal, propane, gas, and electric or can be used as a baking mat or pan liner. The Golden Grill Mat is reusable, so stop wasting money on aluminum foil or other disposable grill covers! Golden Grill mats are not only 100% non-stick, but they are reversible and reusable, saving you money for years to come. Perfect for those nasty campground or park grills! No more scrubbing grill grates every time you cook! Quickly hand wash with soap and water or stick in the dishwasher ( top rack only ) to use over and over again. Our grill mats are PFOA Free. The unique coating outlasts traditional mats and can handle temperatures up to 500°F. Thicker than most mats to last you years, but thin enough to see your grill marks in your steak!